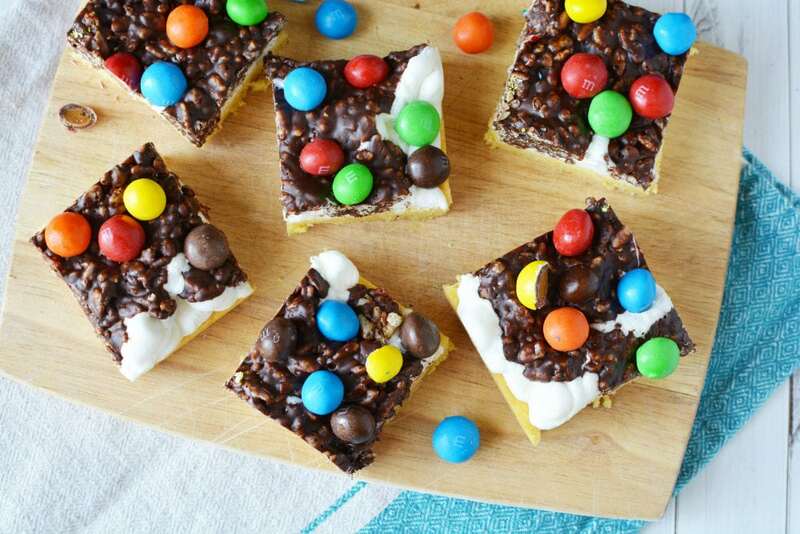 This caramel cookie bar recipe is actually layers of all your favorite desserts. Can’t decide if you want salty or sweet, cake or candy, fluffy or chewy? 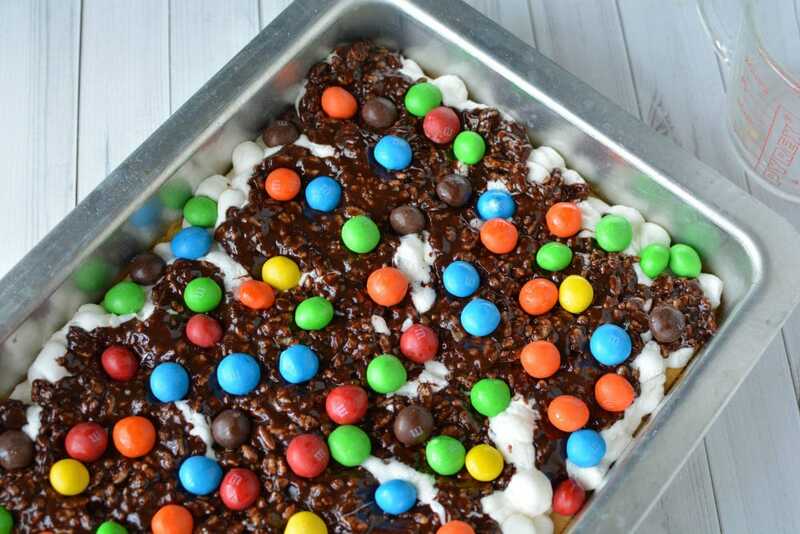 Make this dessert that has them all combined. If you want to make a unique dessert this season, give this layered recipe a try. There’s a lot going on in this recipe creation. Sometimes marshmallows are a little too sweet on their own but mixed with the rest of these treats; it’s a scrumptious blend. Chocolate, caramel candies, the crunch of cereal, the sweetness of marshmallow, and a cookie-like base gives your tastebuds a bit of a workout. Did you know that caramel M&M’s exist? We sure didn’t until now. 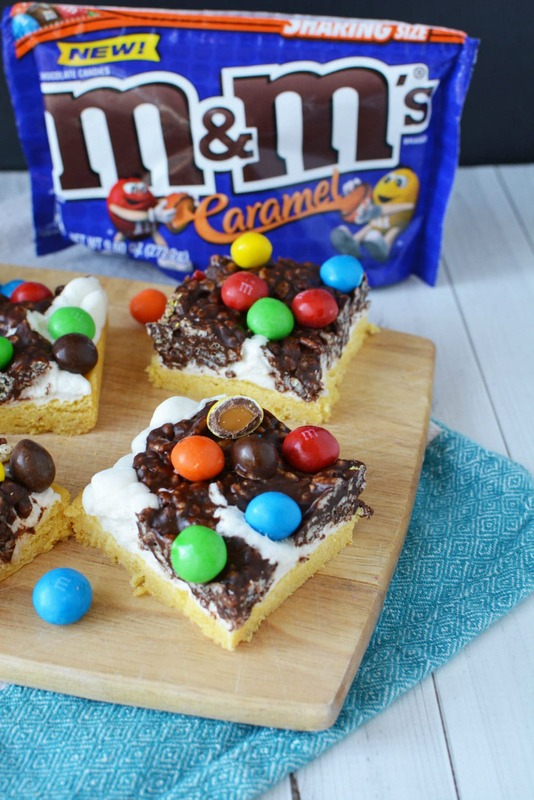 Of course, caramel M&M’s are delicious on their own, but they are especially tasty in this recipe. The gooeyness of caramel adds to the many dimensions of this dessert. There’s something extra satisfying about desserts in bar form. It’s like getting the corner piece of a brownie. I love a good cookie as much as the next person, but bar desserts — especially layered — are an extra appreciated treat in most cases. Can't decide if you want salty or sweet, cake or candy, fluffy or chewy? 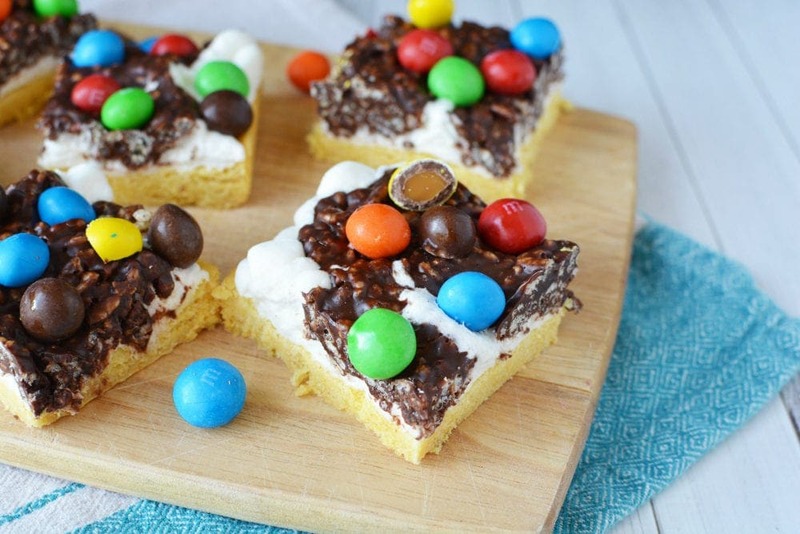 This layered cookie bar recipe is for you. Preheat oven to 350 and grease a 9x13 baking pan with nonstick cooking spray. Set aside. Mix cake mix, melted butter, and egg together in a mixing bowl. The dough will be stiff but continue to mix until it comes together. Press evenly into prepared pan with your fingers or the back of a spoon. Bake for 12-14 minutes or until set. Remove from oven and sprinkle with marshmallows. Return to oven and bake for another 2 minutes or until marshmallows are puffy. Remove from oven and set aside. In a saucepan, mix chocolate chips and corn syrup. On medium low heat, constantly mix until melted and smooth. Remove from heat and stir in vanilla. Stir in cereal. 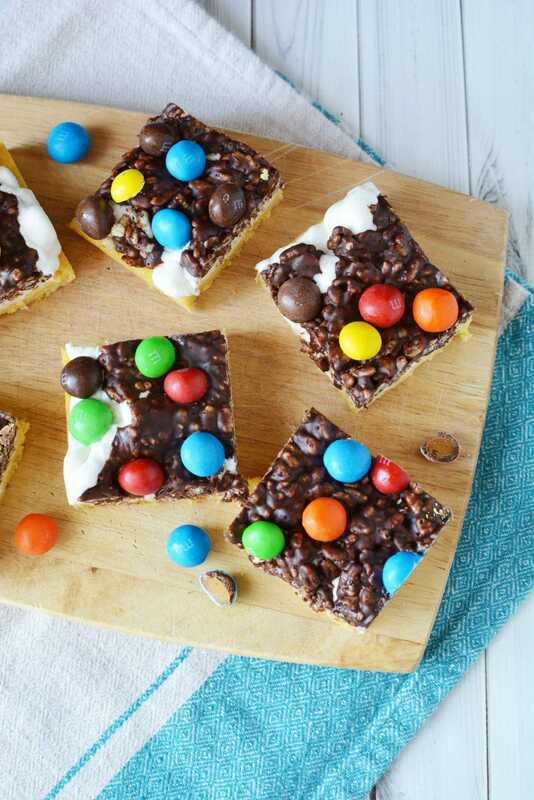 Place dollops of chocolate and cereal mixture onto the top of the marshmallows. Gently press down with the back of a spoon. 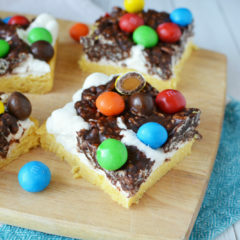 Sprinkle with M&M candies. Let set for about an hour before cutting into 24 bars. Entertaining season is upon us. Between back to school time and the upcoming holidays, there are many opportunities to make sweet treats. Put this caramel cookie bar recipe on your list to please your friends and family with something a little different. If you’re already planning your Christmas cookies, we have a Pinterest board you may want to check out. This recipe might be a good candidate for bake sales, too, depending on the allergen rules. If you love chocolate and caramel together, here is a round up of all kinds of recipes. Do you think you would like this caramel cookie bar recipe? Wow what a delicious treat! My grandsons love all kinds of M&Ms and would be so excited to eat this!